Italy, 2006, 110 minutes, Colour. Giacomo Rizzo, Laura Chiatti, Fabrizio Bentivoglio. This is very much a mood film, an unpredictable blend of naturalism, dream and surrealism. Liking it will depend on moods. It is also a rather creepy film. The central character and his behaviour are definitely creepy. According to the press release, everybody likes Geremia. That was not my impression from watching the characters interact with him. And this review is a dissent. Geremia is creepy and unlikeable. He is seventy, ugly, lives with his dominating and invalid mother, runs a tailoring business but is a moneylender, exacting and demanding. We see a number of his victims, including parents borrowing for their daughter’s lavish wedding. Geremia is a constant womaniser and takes advantage of the bride to be – whose psychology throughout the film is inconsistent and baffling. The same is true of his longtime friend who helps set up money lending targets. Pride comes before a fall and Geremia falls hard but it is very difficult to generate a modicum of sympathy for him. Geremia demands full interest from his customers – but he has a hard time getting interest from the audience. 1. 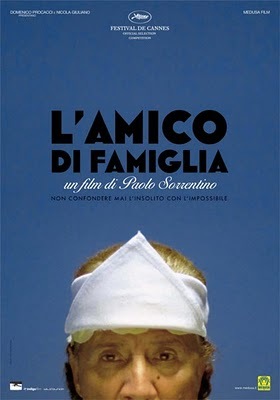 The films of Sorrentino? Realism? Fantasy? Surrealism? The impact of this film in story, character, plot? 2. The town settings, the interiors, Geremia's home, dark? His tailor shop and bright? The exteriors? The church? The beach? Authentic atmosphere? It filmed surrealistically? 3. The film as a portrait of Geremia? The press notes saying that everybody liked him? How true is this for the audience? Seeing him with his potato healing cloth on his head? His relating to his mother, her complaints? His going shopping? His looking for a maid, the interview with the Romanian girl? Seeing him in his work, lending money? His being hard, exacting? The woman who wanted the operation? The parents wanting the money for their daughter? The other clients? The business deal and the borrowing of a million euros? His eyes for women? His friendship with Amanada? Walking around the city, finding girls, sunbaking and sleeping etc? His meeting with Rosalba? The wedding, having to sew her dress? The sexual relationship, his pressure on her? they did the set-up to get the million euros, the plan with Gino and Rosalba? His disillusionment? Back home, the threat and the shooting? The funeral? His pursuit of Rosalba, her rejection, her changing her mind? The irony of the revelation that Gino and Rosalba turned against him? His recovery, not lending money any more? Rosalba coming to see him? What future? 4. Rosalba, her winning the contest, her proud parents, her ability to dance? The wedding, her discussions with her father, not wanting the big ceremony? His paying the money so that he wouldn't be humiliated? The discussions with the in-laws, the cost and menu? The borrowing of the money from Geremia? The ceremony? The aftermath, the encounter with Rosalba's husband and her considering him an idiot? Her approach to Geremia after his treatment of her at the wedding? The revelation that she was plotting against him? Her final arrival and rejection? 5. Gino, friend, pretending he was a cowboy, at the square-dancing? His setting up clients with Geremia? The twins and their violence? The ultimate betrayal? 6. The women, Geremia's mother and her complaints, her death? Amanda, the neighbour, Geremia's treatment of her, his final thoughts of her - saying nice things? 7. The creepy atmosphere of the film and the story? Relationships? The film depending on people's moods for a blend of realism, dream and surrealism?